This five bedroom home features generous walk-in closets, skylights and elegant ceilings. Columns and a tray ceiling define the dining room, while a massive serving bar brings the entire living space together by the kitchen. With its cooktop island, nearby pantry, and large front-facing window, the kitchen has an exceptionally open feel. The master suite offers a sitting room with porch access. 1st Floor: 3360 Sq. Ft.
Porch - Front: 177 Sq. Ft.
Porch - Screened: 284 Sq. Ft.
Porch - Rear: 279 Sq. Ft. 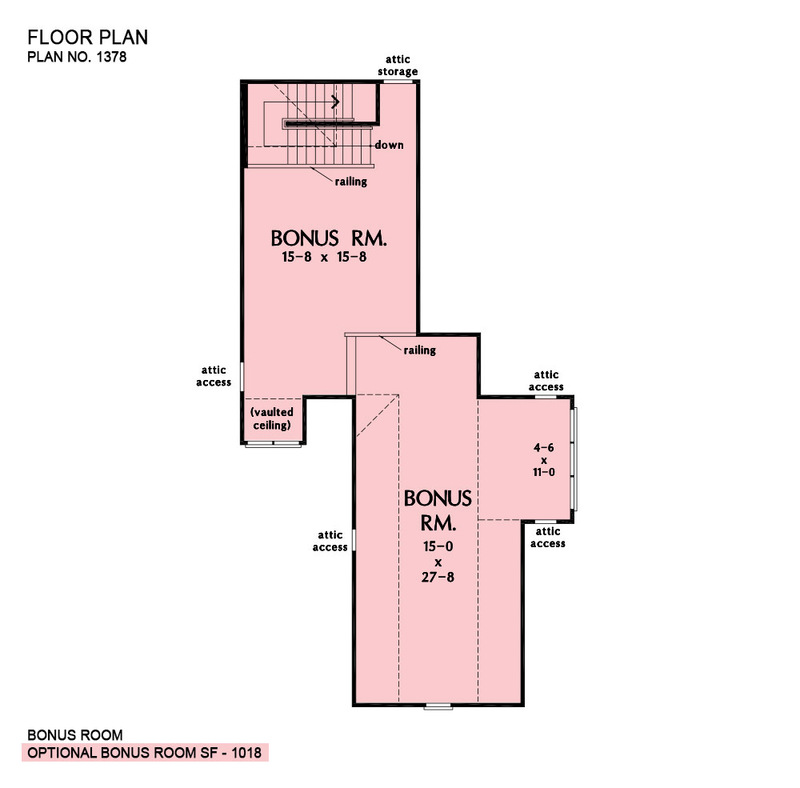 Bonus Room: 1018 Sq. Ft.
House Dimensions: 88' 8" x 78' 0"
Sitting Area (Vaulted): 10' 0" x 10' 0" x 15' 8"
Wet Bar (Flat): 2' 0" x 7' 8" x 10' 0"
Mud Room (Flat): 10' 0" x 5' 4" x 10' 0"
Bedroom #5 (Flat): 13' 8" x 12' 0" x 10' 0"
Foyer (Tray): 7' 8" x 8' 2" x 12' 9"
Dining Room (Tray): 15' 8" x 13' 4" x 13' 6"
Great Room (Coffered): 20' 0" x 20' 6" x 13' 7"
Kitchen (Flat): 16' 0" x 15' 4" x 12' 0"
Utility Room (Flat): 12' 0" x 9' 0" x 10' 0"
Bonus Room (Clipped): 15' 0" x 27' 8" x 8' 11"
Garage (Flat): 24' 0" x 33' 4" x 0' 0"
Master Bedroom (Tray): 15' 0" x 17' 0" x 11' 6"
Bedroom / Study (Coffered): 12' 0" x 13' 10" x 13' 5"
Bedroom #3 (Flat): 12' 0" x 13' 0" x 10' 0"
Bedroom #4 (Flat): 12' 0" x 13' 0" x 10' 0"
Porch - Front (Barrel): 29' 6" x 6' 0" x 11' 4"
Porch - Rear (Flat): 29' 4" x 9' 6" x 9' 9"
Deck / Patio (None): 27' 4" x 16' 10" x 0' 0"
Porch - Screen (Flat): 16' 0" x 16' 0" x 9' 9"